Do Good Lab is partnering with the Kachere Development Program to install two flour mills for a small business cooperative of women entrepreneurs. Women make up 85% of the agricultural workforce in Eastern Zambia. To learn more about the homeland of Kachere, read on! The country of Zambia is known for its stunning natural beauty and variety of wildlife. Each year, it draws thousands of global travelers seeking adventure and awe-inspiring views in its world-renowned state parks, along the mighty Zambezi River, and at the famous Victoria Falls, a UNESCO world heritage site. More than half of the country’s 752,000 square kilometers is arable land, and the country is rich in natural resources, especially copper. 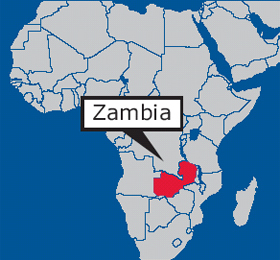 Compared to many of its neighboring countries, Zambia has also been relatively politically stable. Zambia made a relatively peaceful transition from British colonial rule in 1964, and the country has been spared the destructive civil war that countries like the Democratic Republic of Congo have faced in recent years. Zambia’s natural beauty and great agricultural capacity are at a stark contrast with the economic problems facing the country today, however. Zambian farmers have had to deal with droughts, floods, and extreme weather over the past 10 years. In 2005-2006, a drought left over 1 million Zambians without enough grain for nine months. The next year a flash flood displaced nearly half a million people. According to World Bank figures, an estimated 60% of the country’s 13.8 million people live below the poverty line, with most of those in Zambia’s many rural areas. Life expectancy for the average Zambian is 49 years, in part because of the HIV/AIDS pandemic, which has ravaged the population. Just over 12% of Zambians ages 15-49 are infected with the virus, and UN figures show that about 1 million people were living with the disease in 2011. One-third of the population is without access to clean water, and more than 25% of the country’s schools do not have access to clean water and proper sanitation. The country is reportedly on track to meet the Millennium Development Goal of universal primary education, but enrollment in primary schools is just under 72%. Zambia is also making progress toward its other Millennium Development Goals, reducing child mortality from 191 per 1,000 births in 1992, to 119 per 1,000 in 2007. Extreme poverty in the country declined from 58% to 51% over the same period, and in 2002 the country eliminated school fees for basic education, an important step toward universal primary education. These indicators are promising signs that progress is indeed being made toward relieving the misery of poverty and disease in Zambia. They also suggest, however, that there is much more work to be done. *To find out more about the Millenium Development Goals, please click here! Posted by Aezed Raza on Tuesday, September 3rd, 2013 at 11:48 am.